Humble Bundle is long established as a service that groups together games, eBooks and music into affordable packages, for which you pay what you want and determine how much money goes to the creators, Humble itself and a chosen charity. It's in gaming circles that it's best known, is hugely successful with Indie and major publisher collections for PC and also for smart device game bundles. Until recently, however, consoles were out of reach. It was certainly surprising, then, that it was Nintendo that broke that duck, with the Humble Nindie Bundle having already sold over 57,000 units and raising over $500,000 in under a week. It's a two week promotion and more games will be added; it's undoubtedly regrettable that it's only available in the Americas, however. We already spoke to Nintendo of America's Damon Baker last week and have a detailed interview with Humble Bundle co-founder John Graham on the way later. In this look at the bundle, however, we catch up with those publishers and developers that are selling their work in that first ever console bundle - namely Curve Digital, Drinkbox Studios, Over The Moon, Renegade Kid, Image & Form and Choice Provisions. The announcement of the Humble Indie Bundle had particular impact, in part, courtesy of the surprise factor at Nintendo leading the way in the console space. That surprise wasn't universal, however - Nintendo has in some respects been either leading the way or in the main group when it comes to devolving power to Indies and changing the ways in which download stores operate. Examples cited to us by developers often come back to strengthening relationships with Indies and practical ideas such as cross-buy. It's clear that the eShop team is a strong force - John Warner of Over The Moon (The Fall) was quick to highlight the fact that staff at Nintendo are often "open minded and excited" about the evolving download scene. Rob Clarke, PR Manager at Curve Digital, also tackled the potential reasoning for Nintendo being more open to the Humble Bundle concept than its contemporaries Sony and Microsoft, essentially getting there first. I won't pretend I saw it coming, but it does make sense. Sony and Microsoft are seen as 'ahead' of Nintendo when it comes to digital, but for those guys, keeping people in their ecosystems is really important. That's why Plus and Gold are such a big deal now, and it's a whole different thing working with an external company like Humble. When you look at what Nintendo have been doing recently, it's not all that surprising they did this first. In the last few years Nintendo's approach to digital with things like the digital only E3 and offering cross-buy titles is all really exciting. There's that word exciting, once again, but we should point out that some of the participating developers are still slightly surprised at what's transpired. Brjann Sigurgeirsson, CEO of Image & Form (SteamWorld Dig) is always supportive of Nintendo and the eShop, but told us "I thought I'd misread it" when the message came through asking the studio to take part. He explains that it seemed "wildly out of character" for Nintendo - while the company is often praised for its forward-thinking approach, Sigurgeirsson highlights that the old perceptions of slow and steady Nintendo aren't completely irrelevant. I've now met with the platform owners a number of times, and I generally view the Nintendo reps to be cautious. You get the feeling that every decision of any importance needs to travel to Japan and back, which gives the impression that most "new" or "untried" ideas take a good while to mull over. I think Microsoft has its own agenda for Xbox One and Windows, so they may have considered it counterproductive. But I'm surprised Nintendo beat Sony to it, who often come across as faster and more dynamic. In general the developers we spoke to state they were enthused when asked to take part by Nintendo, especially as a number of these studios have an established history with Humble. Though the decision was taken eagerly, though, it's loaded with important considerations. Let's not forget that a significant part of the appeal from a consumer standpoint is the potentially ludicrous value on offer, with 'pay what you want' allowing gamers to get up to eight games (some with multiple versions) for $10 or slightly less. That's just over a dollar per game, and don't forget that more games are confirmed to be on the way today (2nd June) at 11am Pacific time, tilting the value further down per game. The circumstances around this choice, understandably, vary between developers and the games they're submitting. Dant Rambo from Choice Provisions (publisher of Woah Dave! ), explained that the company's long relationship with Nintendo - formerly as Gaijin Games and well known for the BIT.TRIP titles - combined well with the market status of the quirky 3DS release. Quite simply, its natural sales on the eShop will be long past their best. Timing is certainly a big factor. If a game was just released, we're going to be a little more apprehensive about offering it at a discount or in a pay-what-you-want scenario. But if the game's been out for a while and we're looking for a way to get it back on people's radar and generate some buzz, then getting it in a bundle makes a lot of sense. We posed a key question to each developer - how do you weigh up the financial implications of giving away copies of your game, potentially, for a return of less than a dollar per sale? The common answer was simple - exposure. Humble Bundle has achieved much success and become a recognisable brand, particularly among PC gamers and - to some extent - smart phone gaming aficionados. Graham Smith from Drinkbox Studios (Guacamelee! Super Turbo Championship Edition) told us that a long view is required - "with each download you're also creating a potential new fan of the company, who might now buy your next game when it launches." The timing is apt for this writer, notably - days before Humble Bundle emerged I wrote a fairly personal opinion piece on issues around eShop pricing and the 'value' of games. Yet it was a self-confessed idealist's piece, and not necessarily offering solutions or answers to the issue. The realities of what gamers will pay to take a punt on a new download from an unfamiliar developer are tough - John Warner of Over The Moon explained that this is an adjustment he's had to make to his thinking when embracing Humble Bundle. The value he places on The Fall is necessarily secondary to actually getting it into gamer's systems. We're quite proud to be promoted by Nintendo here, and especially so since this is the first console bundle; this is a pretty damn cool thing to be a part of... But again, we've already done similar promotions and were comfortable with the idea of being part of a Humble Bundle by the time the invite came along. I didn't always feel this way though; when we launched The Fall a year ago, I had the general sense that bundles were devaluing video games everywhere, and I hated the concept. However, I think that view is fundamentally out of touch with reality to some extent. The unfortunate reality is that there are a lot (and I mean a lot) of indie games, and more are coming every day. Developers have been forced to compete for promotional space. Furthermore, bundles are a good way of reaching players who wouldn't otherwise purchase a game. Additionally, in our case, The Fall will be a trilogy, so it makes sense to get a wide distribution for part one. The 'event' nature of Humble Bundle is another factor raised when we pushed the issue of pricing and value. Jools Watsham of Renegate Kid (Moon Chronicles) shared his view that there's an effect of it being "similar to a holiday sale or other rare promotional events you see in other industries". That one-off nature in which you can pick up a diverse batch of titles all at once for a limited period, in this case two weeks, detracting from a sense of 'devaluing' games. Another notable part of Humble Bundle, which further assuages some negative perceptions, is that payments are split as the gamer sees fit between the developer, Humble and a chosen charity - Code.org in the case of the Humble Nindie Bundle. Watsham feels that it's a win-win for all concerned - "I feel good that my game can help contribute towards a charity, and I expect the players buying the bundle feel good about their money helping others too." Image & Form's Sigurgeirsson (and all of the developers, in their own ways) echoed this sentiment, with the SteamWorld Dig developer's past history of trying to support good causes providing further incentive. The very principles behind Humble Bundle, perhaps, play into compassion and comradeship among developers and gamers. Image & Form is about making great games, but also about personal and company legacy. I think it's important that we're doing something good other than provide excellent entertainment. And being charitable isn't about raising money - we decided a long time ago that we would try to help other indies with whatever we can, such as intros to key industry people, sharing tips, sales figures, and so on. Doing good feels good. Of course, the question is whether we'll see more Nindie Bundles in the future; Nintendo of America's Damon Baker was positive in terms of telling us that the company is "absolutely interested" in future collaborations. Of course, a future campaign will hopefully include PAL regions, and it goes without saying that all of the developers shared that sentiment with us - there are many positives to this first bundle, yes, but that's a negative that is tricky to escape. Looking at what's next, though, there's a consensus that we could certainly see additional bundles, but that they shouldn't - or perhaps can't - be overly frequent. Sigurgeirsson argues that "one Nindie bundle per year could be adequate" as the eShop library simply doesn't have the staggering diversity to be found on PC and smart devices. Dant Rambo from Choice Provisions feels diverse pricing and bundles can have a future "provided developers continue to be able to sell their games at prices they're comfortable with and not feel coerced into devaluing their work". John Warner, a relative newcomer with The Fall - perhaps - in comparison to the other companies involved, once again highlighted the pricing dilemma highlighted above; it's the battle between market realities, aspiration and a desperate need for exposure. The truth of the matter is that as an indie, the growing number of games being made, and being made available at a low discount is, without a doubt, a concerning reality, or at least a complex one. Will more and more bundles ultimately help us or not? I really don't know. The fearful part of me wonders if there'll come a time where I'll be expected to sell my games for ten cents.... But what am I going to do? Am I going to say no when Nintendo reaches out to me like this and I need the visibility? That reality is what counts for these developers, ultimately. All six studios were emphatic with one answer when asked whether they'd be interested in participating in another Nindie Bundle in the future - yes. Provisos also remain, though; Sigurgeirsson feels "all devs should be a bit wary and plan it towards the end of any game's life cycle", though leap at the chance if the time is right and the exposure is worth the risk. After all, a whole new audience may just be getting more familiar with the eShop and these games courtesy of their appearance in a Humble Bundle. With over half a million dollars raised in less than a week, we suspect the strong appetite shown for the bundle will see it return again in the future. 3 seconds ago? Man, I am on here too much. Havent purchased yet b/c we have Guacamelee and the rest dont really appeal to me, even for $10 (just spent $14 on a silver Mario amiibo yesterdsy I didnt even want, but no, you cant have him either) but I suppose I should to support the concept for future considrration. Who knows, maybe all the New Club Nintenfo points will be retroactive for all our NNID purchases and redemtptions. It is interesting to see the average price was (It is a bit less now) double that of the current Sega / Relic bundle (That is full of AAA's). @rjejr Guacamelee is an awesome game. If you enjoy "metroidvania" games at all then you will like this game. It's got some funny content as well. I can't wait until the next game is announced! It's too bad that this has only raised $500,000 in a week. I would have expected it to do more... though it being region locked probably does not helped. I hope Nintendo asked Yacht Club Games. And I hope they said yes. Not quite sure what you mean, half a million is a HUGE amount of money. Especially for a few indie games only available on two platforms with reletively low hardware sales between them. @Mogster Well think about it, usually when you have large companies do something like this, you get money raised in the millions. This will be lucky to even reach a million. Keep in mind that they'll be adding more games today. A lot of people (myself included) are likely waiting to see what gets added. I don't think this is the first time a Bundle was a bit slow at first, but picked up once everyone saw the complete offerings. You do get the added games if you paid over the average at the time of your purchase, but many probably want to see what they are actually getting before investing. I am absolutely loving Whoa Dave! It's probably my favorite of the bundle. Just a very fun, addicting game. Big thanks to the developer for creating it!! I really hope they do these more. The thought of Humble Bundle reaching any console at all never even crossed my mind (especially not Nintendo of all companies). But the fact that it happened and that it had good games AND it did well enough is amazing. I love Humble Bundle and I'm really hoping this isn't a one-time thing with Nintendo. It's an opportunity that can't be missed. Not only does it helps the developers as per usual with every bundle, but it helps Nintendo as well. It still has a week to go, so we'll see whether new game additions give it another big bump. I never would've picked up Guacamelee if it weren't for this. Thank you humble bundle. These aren't large companies nor are these AAA titles. A lot of bundles that humble/indiegala/bundlestars/etc throw out there fail to reach the level the Nintendo bundle is at. You have to consider region locking, the availablility of a few of these games from other previous bundles for steam users (which is humbles core audience), a lot of people just buying the $1 tier, and then those waiting to see what other titles are unlocked. Overall to be at $530K with 7 days still to go and more games to be unlocked which will draw even more audience....its going very well. 2. A lot of those Wii U owners probably have it for Skylanders and Disney Infinity, so they probably never even go onto the eShop, much less have any idea what a Humble Bundle is. 3. People who do shop on eShop, like myself, probably already purchased Guacamelee, like myself, so aren't biting on the rest. If this were to become a regular occurrence in the US - say every other month or so - so that word of mouth started to spread, then maybe you would get more sales, but for something so out of the blue and un-Nintendo. aimed at such a small group of people, it seems to be doing just fine to me. As I said earlier I may still pick it up, just b/c, but I'm in no rush. @Captain_Gonru - "That "free" ride is over"
But it can't be over, I need my yearly desk calendar. Nintneod will give us something for free. They can't ditch the DDP and all the free goodies from 2 promotions and then come up w/ 1 replacement that doesn't offer anything to get us to fill out all those surveys. I think this humble bundle, the deal w/ DeNA, and the free to play or start games like Pokemon Rumble and Shuffle and Rusty and Sub Wars means Nintneod is willing to pay us to play. Not sure what form it will take, but there will be rewards that matter. Though I realize "matter" is very subjective, some people only like physical rewards, some people like free games, some people like discounts so they can chose their own games. But we will get something. I grabbed the bundle, since I only owned two of the games listed already, and most of the others were on my wish list. 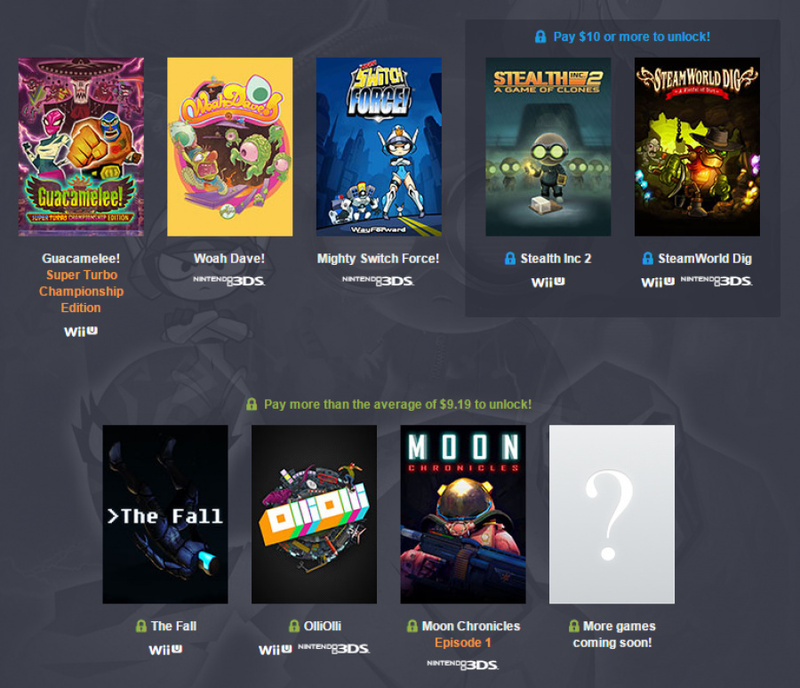 I'm new to Humble Bundle, so something like this like a wish-come-true for me. @ThomasBW84 Thanks for the nice interview and article. I bought the bundle just to check out some games I didn't already have and would have otherwise not bought, (and give away codes to friends for ones I already had). If I really enjoy some of the games I will definitely be inclined to buy future games from the developers at full price. I was happy to pay full price for other games like Shovel Knight and AVGN Adventures, but with so many games available and limited gaming time I have to be pretty selective with what I buy. I imagine the developers get a decent amount of money back from this too, considering these are games that are probably barely selling any copies at all at this point (at full price). Everyone should donate now solely to experience Guacamelee! I don't know what the webpage is supposed to look like when a bundle isn't available in one's region, but I can see the bundle, and last I checked, Canada is just lumped with the US were region is concerned. It's more accurate to say it's available in North America, not the States. Not that US ever likes to admit that North America is more then just them. We're just the 51st state according to some idi- erm... uneducated people. I had a bunch of the games already (Guacamelee, Steam World Dig and OlliOlli. I bought it anyway because I wanted to support this. I figure if I like just one of the games I didn't have (The Fall or Stealth Inc), then it was worth it. It also helps that I was able ot give Moon Chronicles to one son and OlliOlli for the 3DS to another. I gifted the 3 WiiU games to a friend of mine. Can't Wait to see what games get added. @Captain_Gonru - "Don't confuse "caring" and "competency". Nintneod is composed of two sets of people, talented developers who make great games, and a bunch of bureaucrats who shouldn't be permitted to run a hot dog cart. And all that free stuff, that's not them caring about us anyway, that's marketing $. There's no free, just exchanging our time for Nintnedo's profit. Gaming industry may frustrate you now, but I'm older than you, capitalism has frustrated me for years. @DarthNocturnal - Well nice to see Canadians able to join in on the fun for a change, usually there's just griping and take off, eh? We don't really miss out on too much overall. Although we do get the shaft for major events (Symphony of the Goddess was all over the states, but was only in two, maybe three provinces). And the recent limited edition and amiibo shortages probably ensure we get the short end of the stick. But we still had Club Nintendo, and we get the North American eShops. So we're nowhere as bad as, say, Europe. But generally speaking, if US gets it, we will too. If you sell a game for $1 and there is 75,000 new sales, it's still not a bad turnover for that exposure, especially if most of those buyers were never going to purchase otherwise. But as the devs said, timing is the key. @DarthNocturnal - Maybe it's worse on Sony's side? I spend a lot of time on Pushsquare and Sony has a lot of promotions - PS+, PS Vue, PS Now. Also spent way too long last autumn researching streaming boxes for my new bedroom tv - Fire, Roku, Apple, Sony - finally settled on a PS3, and I think there was a greater divide in digital streaming. I just looked up PS Now in Canada... and yeah, that looks pretty bad. The few internet providers in Canada are enjoying a monopoly (well, two of them). Although I wasn't aware that data caps are actually the norm here... but uh, yeah, they're treating us like crap, just because they can. This just strengthens my belief that cloud gaming is NOT a substitute for lack of backwards compatibility on ANY platform, nor should it be a norm for ANY kind of gaming. It's convenient in one sense, but it's also always online DRM that's carefully hidden under the guise of "hey look, no disc!". And uf you don't have access to the net? No game, sorry! Well, at least we get PS+. @sotoam Yeah, this is exactly what I did, and would urge others to do as well. I already had most of the games, so I gave money to Humble and distributed the codes to my friends who recently got WiiUs. Would love to see the eShop be sustainable for indies, so that's what I'm giving my money towards. @DarthNocturnal - Guess I was confusing my gaming and streaming, probably b/c all my streaming is on gaming consoles. HBOgo played a large part in my bedroom PS3 decision, and I don't see Wii U EVER getting the HBOgo app. @Captain_Gonru - "As a aside, I miss Mr. Met. I always lose your posts for the first couple days after you change avatars." Don't worry, in Soviet Russia squid find you. Also gives me a rest for a few days from my detractors. Though all my emoji probably give me away. It's a great idea, although I am never going to like the word 'Nindie'. Great games, great price. Do it again please. Watch: Nindies Direct March 2019 Broadcast - Live!